I must boast; not that it is profitable, but I will go on to visions and revelations of the Lord. I know someone in Christ who, fourteen years ago (whether in the body or out of the body I do not know, God knows), was caught up to the third heaven. 3 And I know that this person (whether in the body or out of the body I do not know, God knows) 4 was caught up into Paradise and heard ineffable things, which no one may utter. About this person I will boast, but about myself I will not boast, except about my weaknesses. 6 Although if I should wish to boast, I would not be foolish, for I would be telling the truth. But I refrain, so that no one may think more of me than what he sees in me or hears from me 7 because of the abundance of the revelations. Therefore, that I might not become too elated, a thorn in the flesh was given to me, an angel of Satan, to beat me, to keep me from being too elated. Three times I begged the Lord about this, that it might leave me, 9 but he said to me, “My grace is sufficient for you, for power is made perfect in weakness.” I will rather boast most gladly of my weaknesses, in order that the power of Christ may dwell with me. 10 Therefore, I am content with weaknesses, insults, hardships, persecutions, and constraints, for the sake of Christ; for when I am weak, then I am strong. My dearest daughter, My children must know that there is only one God. Only one. Any other exists only in the minds of man. Any other god is an abomination in My Eyes and the man who succumbs to worshipping false gods, serves only the devil, who delights in man’s fall from grace. I Am the Beginning and the End. Nothing can prevail against Me. Even the demons and fallen angels, which I cast into the abyss, will never stand before Me and challenge Me, for they are without such power. So many religions have been founded by fallible man, and this has caused much confusion. From the beginning I spoke with One Voice and, until the end, there can only be One Voice. The world is Mine for I created it. I created every living thing. I also created My Heavenly Hierarchy from which I threw out those angels who defied and betrayed Me. Many of these fallen angels communicate with My children who have created a new age form of spiritualism. I warn those of you who adore false gods, through the pursuit of such practices. Such spiritualism will expose your souls to evil spirits whose only desire is to destroy your souls. These false angels are demons, disguised as living spirits of the light, and they will seduce you into believing falsities. Every lie about My Heavenly Hierarchy will be fed to you so that you will place all your needs before satan and evil spirits. All they do is savage your souls like wild beasts and then leave you empty and bereft of any love. At first, when you give yourself over to such idolatry, you will be given a false sense of peace. Demons can give such powers but they are short-lived. For once they gain access to your souls, they will torment you and goad you into demonic acts. I Am all that was in the Beginning and I Am the End. All begins and ends with Me. When you place false gods before Me, and do this because of your selfish desire to seek pleasure, power and control of your destiny, you are guilty of breaking My First Commandment. Without Me you could not exist. Without Me you have no future. Without My Son you cannot come to Me. Reject My only beloved Son, Jesus Christ, the True Messiah, and you reject Me. The Truth was first given to the world when paganism was rife. The Truth was given to the world with the birth of My Son and generations were converted. 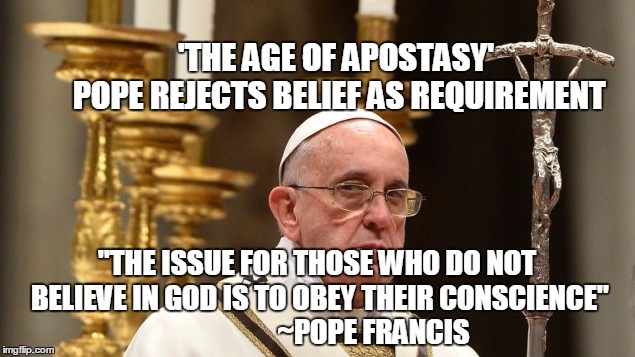 The Truth is being given again to the world now, as the great apostasy strangles the souls of those who believe in My Son, and at a time when paganism is rife again. Just as it was in the beginning when I was rejected by ungrateful men so, too, will it be in the end, when men’s hearts will turn to stone and their souls, will be given away freely to the devil. Then, the world as you know it, will be no more as the New Heaven and the New Earth merge as one. Finally, peace will reign again and I will unite those who choose to come with Me. Jesus and Beelzebul. 22 Then they brought to him a demoniac who was blind and mute. He cured the mute person so that he could speak and see. 23 All the crowd was astounded, and said, “Could this perhaps be the Son of David?” 24 But when the Pharisees heard this, they said, “This man drives out demons only by the power of Beelzebul, the prince of demons.” 25 But he knew what they were thinking and said to them, “Every kingdom divided against itself will be laid waste, and no town or house divided against itself will stand. 26 And if Satan drives out Satan, he is divided against himself; how, then, will his kingdom stand? 27 And if I drive out demons by Beelzebul, by whom do your own people drive them out? Therefore they will be your judges. 28 But if it is by the Spirit of God that I drive out demons, then the kingdom of God has come upon you. 29 How can anyone enter a strong man’s house and steal his property, unless he first ties up the strong man? Then he can plunder his house. 30 Whoever is not with me is against me, and whoever does not gather with me scatters. 31 Therefore, I say to you, every sin and blasphemy will be forgiven people, but blasphemy against the Spirit will not be forgiven. 32 And whoever speaks a word against the Son of Man will be forgiven; but whoever speaks against the holy Spirit will not be forgiven, either in this age or in the age to come. I reunite them with their families and there is much joy, love and excitement. No more tears. No memories of the sufferings, which they endured on earth, remain. All worries, sadness and despair are wiped away and forgotten, in an instant. Death opens the door for those who die in a state of Grace as new life begins.For every soul who is welcomed into My Kingdom, there are different levels, and each one is accorded their reward, based on the Glory, which they have given to God. Do not cut yourself off from Me. If you do, there will be great weeping and you can never be consoled, for I will be unable to help you.My Kingdom will give you Eternal Life but you must ask Me for My Help by reciting this prayer. Jesus help me to believe in Your Existence. Give me a sign so that my heart can respond to You. Fill my empty soul with the Grace that I need to open my mind and my heart to Your Love. Have Mercy on me, and cleanse my soul from every wrongdoing, that I have committed in my life. Forgive me for rejecting You, but please fill me with the love that I need, to be made worthy of Eternal Life. Help me to know You, to see Your Presence in other people and fill me with the Grace to recognise the Sign of God in every beautiful Gift which You have given the human race. Help me to understand Your Ways and save me from the separation and the pain of darkness that I feel in my soul. Amen. Do not allow human pride, intellectual analysis or opinion to sway you from the Truth. As a child of God you are very precious to Me. Do not let Me lose you.Come. I Am Here. I Am Real. Let Me fill your soul with My Presence. Once that happens you will find it difficult to ignore Me. After this reading, (which was chosen by another prayer group member, but was read by Crusader D) she went to close the book, but for some reason, D’s thumb suddenly stopped it from closing. It was not an accident but a decisive movement and she doesn’t know why she did it. She looked down and her eyes fell immediately where her thumb was placed: to the heading of the article on that page, “My most esteemed bishop …”. We were all feeling pretty sad for Cardinal Pell, and just before the meeting had been discussing recent events and the prayers /Masses we were saying and offering up for him. We were talking about how there was a strong air of hate in society and priests were afraid to go out in public. Everything was taken from Him – his Rosary beads etc, and he was not allowed to even say a private Mass in his gaol cell (according to Victorian law). Jesus was reminding us that He was with us in our sadness, and that He was also with our beloved Cardinal. We know that this hate is just a foretaste of what is to come in the future. We didn’t read the reading because we had looked at it many times in the past few weeks. We went on to the next Crusader who had chosen a reading (randomly, as always) and the heading also seemed also to be speaking to us re: the Cardinal Pell situation. Tonight, My beloved daughter, you feel a peace, which you have not felt for such a long time. You, My daughter, have been tortured by the deceiver and now, through the graces that I have bestowed no longer feel the effects of such attacks. I have sent you a clean soul, full of love, to help guide you. He will hold your hand and lead you towards Me and the Truth. You, My beloved daughter, now understand what it is like to suffer in My Name. You know what it is like to be mocked in public, ridiculed behind your back, accused of wrongdoing, of which you are not guilty, and all, in My Name. Rejoice, My daughter, for this means that you have now become closer in union with Me. Prayer, as you now finally understand, will keep you in a state of grace and peace. My daughter, do not judge those who cause you pain. Pray for them. Forgive them. But you have already done that haven’t you? Now you understand the Truth of My Teachings. I will make you stronger and stronger, My daughter. Never fear. As I have told you before, the deceiver will never steal your soul. I hold you close in My Arms and vow that should you stray I will always draw you back to Me. You must now gain the strength and courage to communicate My Divine Messages to mankind. They are urgent. You know what to do. Call Me into your heart every minute of the day. I love you, My brave, precious daughter. I Am proud of you in the way you calmly defended the Truth and did not deny these Sacred Messages, because you now know the Truth. Your loving Saviour, Jesus Christ. Prayers are Groups A & C: (See https://remnantdisciples.wordpress.com/crusade-prayer-group-format/ for details). My dearly beloved daughter, how this Mission has grown and how it will evolve very quickly now, as I prepare for My Time to come. I have begun the next plan to bring awareness to all of God’s children of the great new world, which awaits you and this preparation will be in stages. The first stage is purification. This will mean disruptions, climate changes, upheavals and a terrible apostasy, which will sweep the Earth. These will all take place at the same time. Then, My Church will fall and only the Remnant will hold on to the Truth and bear witness to My Holy Word. I will gather people from every corner of the world – every Christian faith, first. Then I will draw others to Me. Finally, the Jews will be shown the proof of My Father’s Covenant and they will be brought into the Kingdom of God, as foretold. Many voices now drown out My Own Voice, but yet it will only be My Voice which they will notice, for My Tongue is like a sword and My Presence like a fork of lightning. When I make My Presence felt, it will be in the most humble of abodes and shared with kind souls – the gentle, as well as the astute. I will make My Presence known amongst the heathen and, for the first time, they will question their future eternity and begin to open their hearts to Me. You see, not one soul will be left untouched. Some will not welcome Me, but they will know that I Am there. My Time to make My Presence felt, by the Power of the Holy Spirit, is very near. I desire that you reconcile your souls before Me and be ready to receive Me, for you will not know the time or the hour. One thing I will tell you is that it will be sudden. My dearly beloved daughter, as the calamities grow, all around the Earth, on a simple level, man must strive, at all times, to be like me. In your daily lives, it is important to treat others as I have taught you, during my time on Earth. You must always think, first, before you take any action, which will affect another person in ways, which could cause conflict. When you are asked for help, give it. If someone creates a row with you, which you know will cause hurt to others, you must stop this. How you communicate with others will have a direct effect on your peace of mind. Treat others unfairly, speak ill of them or try to cheat them, and you will do this unto yourself. For I will judge you, as you treat others. Anything good within your hearts can be nurtured to enable you to become a vessel, so you can treat others as I would treat them. For, every action you take to please me gives great glory to God. Always seek out the truth in your daily lives, as it will help you in your struggle against the evil, which you will find yourselves pitted against, during every stage of this journey with me. My dearly beloved daughter, as I continue to cleanse the world with my gift of the Holy Spirit, greater hatred for me, Jesus Christ, ensues. As my presence increases within the hearts of man, the amount of hatred will be seen through the actions of those who contradict my most holy word. Those who continue to bring in laws, which blaspheme against God, will increase every effort to defile the word of God. These vile acts must come to pass, as the Earth is being purified. As the cleansing intensifies, so too will the evil of sin be exposed to you. You will notice that every conceivable act, which is against God, will be promoted by those enemies of mine. Many will profess their innocence, but these acts will not be accepted by those of mine, who know the truth. The gift of discernment, which I bequeath to many souls, means that these evil acts perpetrated by those in positions of power, who control nations, will be seen for what they are – the work of Satan. Satan’s evil spirits have increased their presence in the souls of those who do not believe in God. Not content are they that such souls turn their backs on God, these wicked spirits goad these people into promoting the most vile sins. In time, these souls become so corrupt and full of hatred for God, that they will plunge into a darkness, which will never be able to tolerate the light of God. Remember, My Mercy is great. It will only be by My Mercy that these people can be saved. There is no other hope for them, for many of these tortured souls are not capable, by their own free will – so infested are they – of asking for My Hand of Mercy. Those of you who know me and who love me must help these poor people by begging for the salvation of their souls. You must ask that they turn to me now, so that I can intervene to stop the persecution they intend to inflict upon the world. You must beg me, through personal sacrifice, that they are stopped from the genocide they are planning. The worst form of genocide will be seen through unjust wars and the murder of the innocent in their mothers’ wombs. My dear children, be mindful of those who persecute you in the Name of my Son, Jesus Christ, as they will be careful to hide behind a veneer of holiness. The evil one will never present as he really is, because he is far too cunning. He will, instead, through the souls he influences, approach you with a façade of love and many will fall for this deceit. The words he uses may seem soothing and enticing, but they will leave an uneasy feeling in your soul. When Messages are given to the world by the command of my Eternal Father, they will never make demands of you. They will never give a man power over you to encourage you to pledge allegiance to any living person. All glory must be to God. No man can promise you salvation, as this can only come from God. You may prepare your souls as you have been taught by my Son, Jesus Christ, and receive the Sacraments. You may accept the Gifts of Graces given to you, through me, the Immaculate Virgin Mary, but you do not need permission from anyone in order to be made worthy to serve my Son, in this or any other mission, sanctioned in Heaven. Be wary of the enemies of my Son, as they are everywhere, doing all in their power to blind humanity from the Truth of my Son’s Promise to come again. He will return soon and then the Truth will be made known and all that He promised will come to light. Until the great Day of the Lord you must only focus on my Son and place all your trust in Him. My Son has sent no one to distract you from these Messages, the last of their kind, and any one who claims otherwise does not come from Him. Trust, trust, trust in the Mercy of my Son. Listen to what He has taught you – all is contained in the Holy Bible. His Word is simple. It is not complicated. Just follow His Teachings, which span over 2,000 years and then you will find peace. I say then: Hath God cast away his people? God forbid. For I also am an Israelite of the seed of Abraham, of the tribe of Benjamin. God hath not cast away his people, which he foreknew. Know you not what the scripture saith of Elias; how he calleth on God against Israel? Lord, they have slain thy prophets, they have dug down thy altars; and I am left alone, and they seek my life. But what saith the divine answer to him? I have left me seven thousand men, that have not bowed their knees to Baal. Even so then at this present time also, there is a remnant saved according to the election of grace. What then? That which Israel sought, he hath not obtained: but the election hath obtained it; and the rest have been blinded. And David saith: Let their table be made a snare, and a trap, and a stumbling block, and a recompense unto them. Let their eyes be darkened, that they may not see: and bow down their back always. Notes: (as per Bible) Seven thousand: This is very ill alleged by some, against the perpetual visibility of the church of Christ; the more, because however the number of the faithful might be abridged by the persecution of Jezabel in the kingdom of the ten tribes, the church was at the same time in a most flourishing condition (under Asa and Josaphat) in the kingdom of Judah. It is not now by works: If salvation were to come by works, done by nature, without faith and grace, salvation would not be a grace or favour, but a debt; but such dead works are indeed of no value in the sight of God towards salvation. It is not the same with regard to works done with, and by, God’s grace; for to such works as these, he has promised eternal salvation. God hath given them: Not by his working or acting in them; but by his permission, and by withdrawing his grace in punishment of their obstinacy.